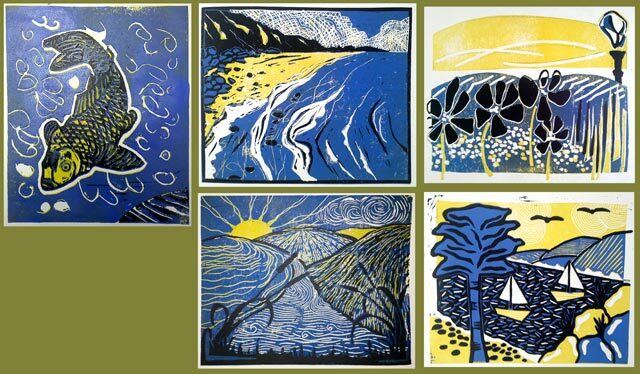 I think printmaking is a bit like Marmite or skiing – you either love it or wonder why anyone would honestly bother (for me: Marmite yes, skiing why?). To that end I teach all my classes in a way that allows the newly addicted to rush home and do it immediately. To say ‘Glad you loved the lino cut, but sorry, you haven’t got a nice Albion press like me so you can’t do it at home’ takes a meaner spirit than mine. To this end I teach reduction lino printing using a table top device to hold the lino in place with a frame to take the paper. It all works a treat and makes multi-coloured prints burnished by hand perfectly possible at the kitchen table. If any of you would like the plans then contact me and I’ll send you the instructions to make it. Not rocket science (or brain surgery), but a few bits of MDF to cut unless you want to make it out of stiff card. Printmaking can be something of a lonely art. I often spend days where the only communication shared is me yelling ‘Oh for God’s sake’ when Radio Four’s afternoon play turns out to be yet another cheering tale of redundancy, terminal illness and relationship angst. This makes it all the more marvellous when I get to meet other printers. 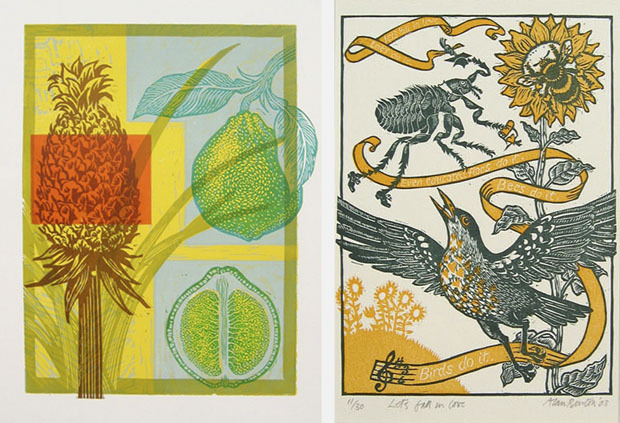 I’m delighted to be able to share a couple of pictures by a printmaker and illustrator I met down in Margate. He’s called Alan Burton and he’s the only other printmaker I’ve met so far who draws directly onto the lino in dip pen to give the image it’s quality of line. 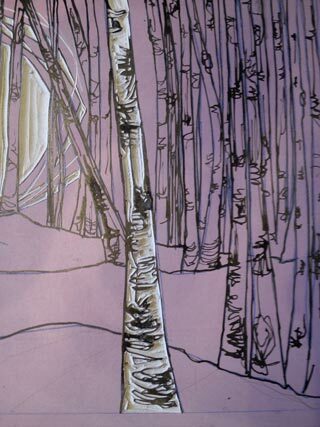 Using pen and ink direct onto lino is a great way of working if you, like me, print with oil based inks. Firstly it stays on the block, good naturedly ignoring repeated washings with white spirit, and secondly it makes where to cut a no-brainer. It gives such a lovely line that the drawing does all the work for me: I just chop out the blank parts. Alan and I stood locked in the mutual pleasure of finding a fellow sympathiser. Why, we wondered, didn’t everyone work like this and why, I wondered, didn’t I get out more? *Not Cornelissen. If I didn’t still have the nibs, I would have difficulty in believing the shop I bought them from ever existed. Sadly it is long gone, along with the elderly proprietor and the wall to ceiling little wooden drawers. Anyway, Turner: what a very clever man he was and how I envy that ability to catch light and shadow. 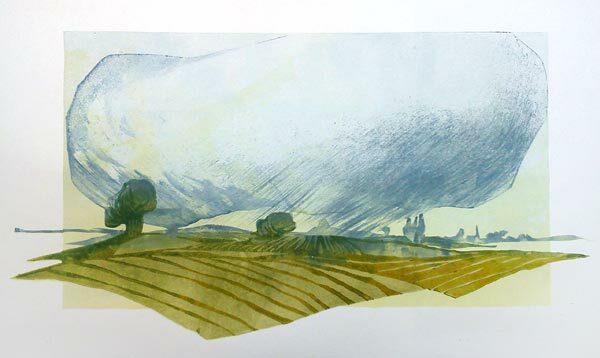 I do try and depict our fabulously unpredictable climate in my prints and I’m always looking for new ways of saying ‘about to rain’ or ‘sun on snow’ etc, but my language is the removed one of printmaking rather than the immediate splash of watercolours. Normally I work with oil based relief inks on lino or with watercolour and rice paste on woodblock, but, excited by Turner and the E numbers in the cup cake icing, I wanted to see if I could get close to a watercolour sketch with lino. One of my experiments is below, a little illustration of the Lincolnshire fens which I drive through when visiting my sister. It’s done in water based ink, a mix of Schminke inks and Graphical Chemical, with an awful lot of extender added for transparency. It’s printed on Zerkal paper which is fine for small prints, but I’ve found to cockle on a larger scale. You’ll notice that I’ve used a brush to put rain into the print. Normally I work with rollers on lino. This time I used a damp but bristly decorator’s brush and swept the ink onto the block before printing it immediately. The trick is to confine yourself to simple bold strokes; the moment you get fussy you lose the definition of the brush stroke. You’ll never produce an identical edition this way, but that’s never bothered me particularly: the weather’s never the same two days running, so why should my prints all match?